With the release of iOS 10, Apple introduced a new way for developers to add integrated new features for iMessage users. 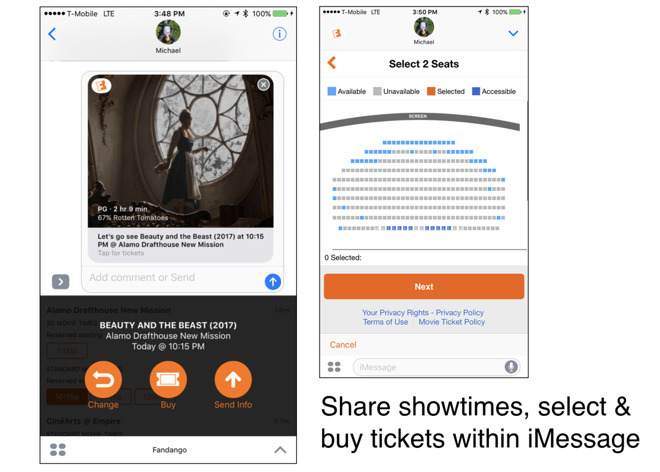 Here's how to use Fandango's app to explore movie listings, share showtime options with chat participants, select seats and purchase tickets with Apple Pay--all within iMessage. Fandango was an early partner in integrating movie ticket purchases with Siri in iOS 6.1, and has also been quick to expand support for Touch ID and Apple Pay. Unsurprisingly, it has also made it easy to look up showtimes and buy tickets in iMessage. With the Fandango app installed, iOS 10 users may only need to activate the iMessage app. That's accessed from the Manage tab of the iMessage Store. If you have "Automatically Add Apps" on, the feature will already be active. Once it's active, you can look up showtimes while in an iMessage chat, and then "send info" for a specific showtime to your chat recipients as part of your conversation. Others in the chat can examine the listing and lookup alternative times, locations and movies. Once you're ready to buy, you simply select the number of tickets you want, select seats (for theaters with assigned seating) and then complete the transaction through your Fandango account. Using Fandango within iMessage is similar to using OpenTable, Yelp or Dine to collaborate on restaurant plans, or iMessage-enabled shopping with friends using apps including Fancy, Jet, Nordstrom, Target and Zappos. Apple has also cultivated a series of collaborative games for iMessage (including Boggle, Words with Friends and GamePigeon, a mini-arcade of turn-based, in-chat apps). 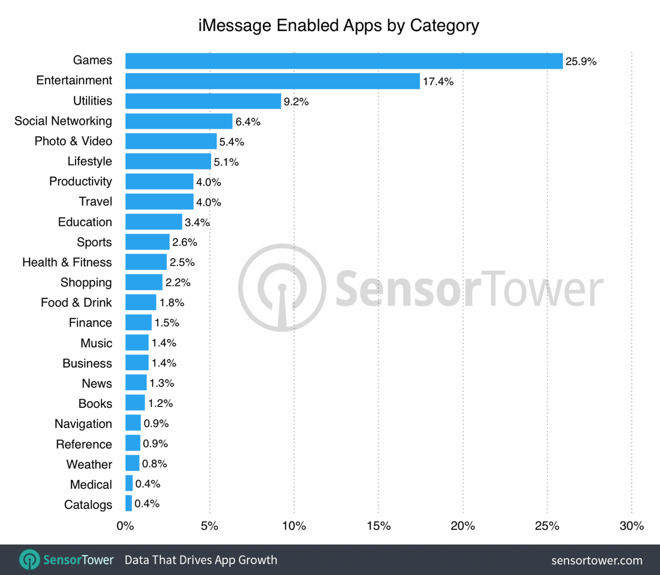 A report by Sensor Tower noted that 25.9 percent of the 5,000 iMessage Apps currently available are games. One of the most popular aspects of the new iOS 10 Messages App Store is Stickers, which enable anyone to publish artwork for sale (or for free), allowing chat users to stick graphics or animations into the conversation. Apple recently began promoting the feature with a new "Sticker Fight" ad spot.